The Storm Rascal 1 Ball Roller has 3" easy-glide wheels and a telescopic handle for easy transportation. This bag can hold shoes up to a men's size 15, all of you accessories and 1 bowling ball. Thank you love very easily fits ball and shoes and love it!!! I`m in luv. Best purchase eva?? 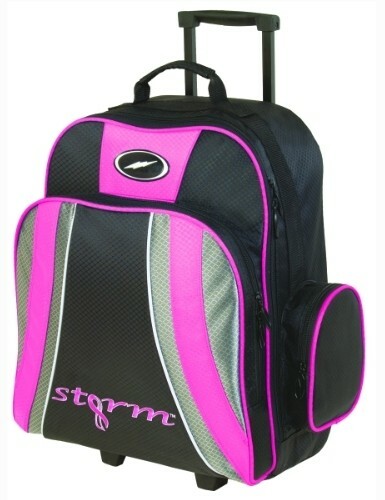 Storm lists the dimensions for this bag as: W:17" x D:10" x H:20"
Give me color chores that storm rascal bowling bag wheels come in so I can pick what color to put on the back of my bowling bag please. It looks like the Storm Rascal 1 Ball Roller only comes with black wheels. how is the handle fully extended? does it re track all back in? The handle is a telescopic handle which retracts back into the bag when you need to store the bag and extends out when you need to pull the bag for traveling. sorry about my question on the handle. I wanted know the length of handle when extended. Hello Jim! The handle is 39 inches when it is fully extended. How big are the wheels, they are not pictured. Hello Sheck! The wheels are about 3 inches in diameter. what is weight of bag? Does this bag have a cup that holds the ball? It will have a foam base that has a cutout for the ball to sit in. Is the weight of the bag almost 28 lbs. without the ball and shoes in it. Seems too heavy for a woman to lift. The weight of the bag without balls would be around 7 pounds. How soon will I get ot. Is yher shipping charges. ? There is free ground shipping to the lower 48 states, that usually take 3-7 business days. The ball will be a tight fit in the bag. The material that the bag is made of will gradually wear in and break in some so that the ball will become easier to fit in the bag over time but at first the bag will be a pretty tight fit for a ball and shoes and accessories. Due to the time it takes to produce the Storm Rascal 1 Ball Roller Black/Pink ball it will ship in immediately. We cannot ship this ball outside the United States.